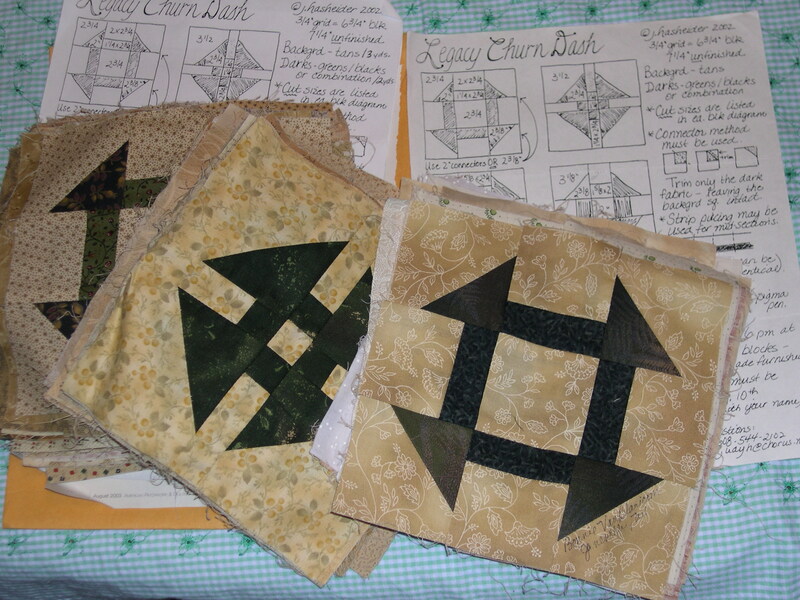 So far, 2009 feels like the revival of quilt block exchanges and quilt-alongs, which I love participating in. Sew-alongs or piece-alongs are a great way to broaden your horizons by giving you a chance to try something new and make new sewing friends along the way! 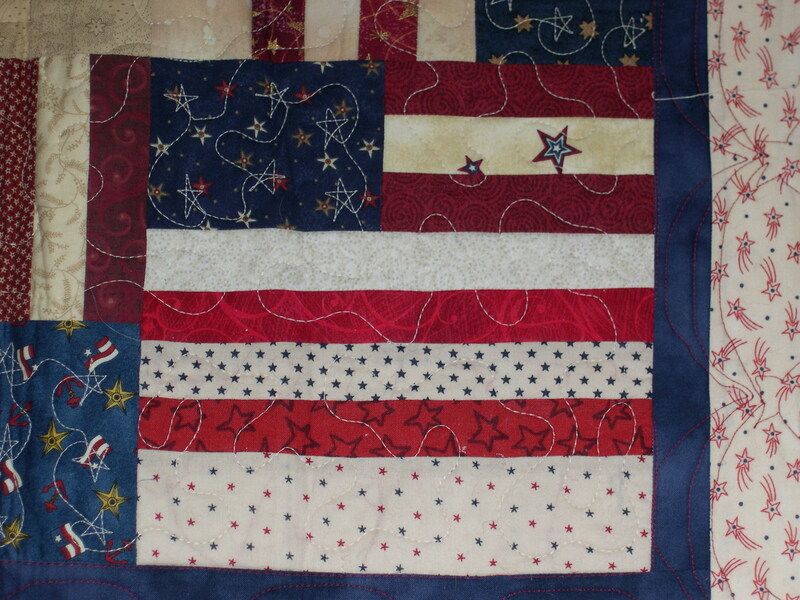 Several years ago, I participated in two block exchanges at my local quilting shop. The shop called them friendship quilts, which seemed fitting because you swap quilt blocks with your sewing friends and piece them together into your own version. These were the first exchanges I ever participated in. 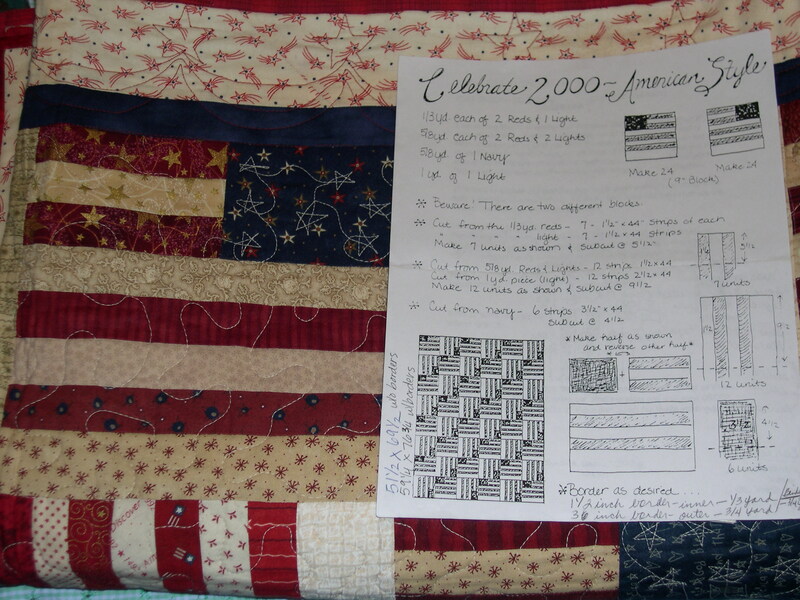 In the first quilt block exchange, participants were given instructions to make 48 flag blocks and bring them to the pot-luck exchange party for our Celebrate America 2000 party. Here is a picture of that friendship quilt I have today, which I cherish for a couple reasons. 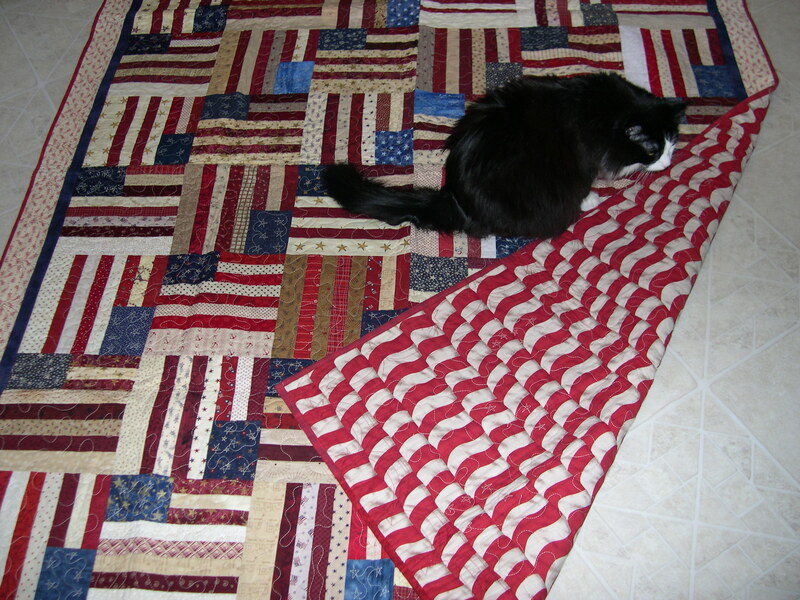 First, it is one of the first quilts I ever made and second, I made it with my old sewing friends. The second exchange was a churn-dash block exchange, where participants brought 72 blocks in four variations to exchange. This time, we each signed our blocks, which is a great way to remember who else participated (especially when you get to my age and start to forget some names of old friends). 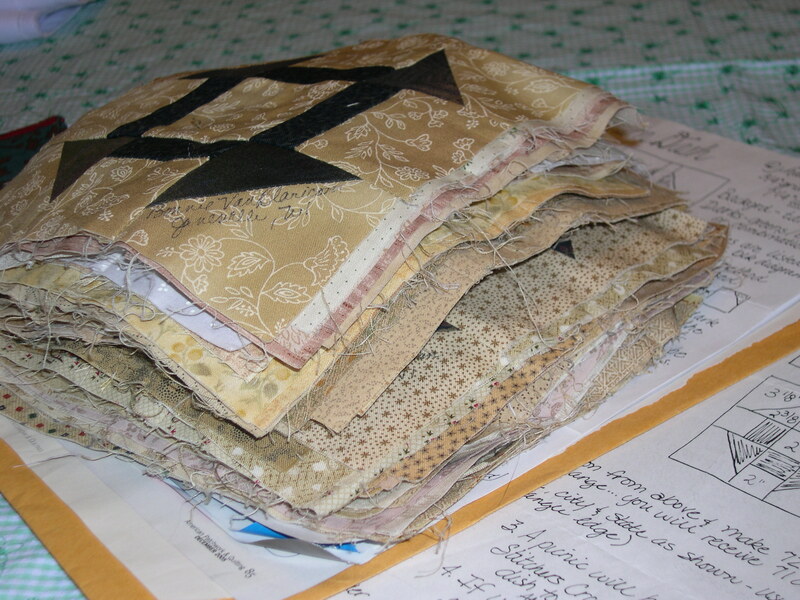 Here is a picture of the pile of quilt blocks that have been tucked in my sewing stash for too many years. 1-Should I set them straight with sashing framing each block? 2-Should I set them straight with sashing in between each row? 3-Should I set them on-point with an accent block in between? 4-My other dilemma is that some blocks are light tan and some are dark tan; what color sashing should I use? I’m one of those people who can get paralyzed with indecision when there are too many choices! What do you think? Thanks, my friends! I have the same “indecision” problem…and it keeps me from finishing many of my projects…I would set them straight…but I’m not sure about framing or just doing sashing between the rows…once I chose my coordinating fabrics I’d play around with different options. Love the flag blocks! I love blocks that have been set on point. You may need to play around with different options for the sashing. Perhaps a contrasting colour such as red would make the blocks stand out. Can’t wait to see what you come up with!! Churn dash is one of my favorite blocks. I would set them on point, and I agree with Lisa. I’d use a contrasting color to add some wow!! I think we all have these delimmas!! 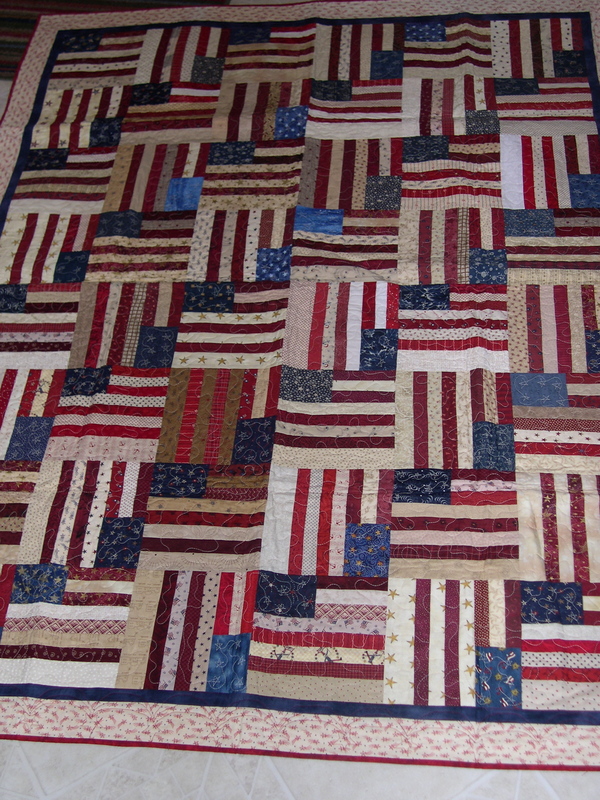 Love the flag quilt! Please forgive my spelling! Typing too fast! I want to join Oh Fransson’s quilt a long but I think it will be too late if I start in 3 weeks so I guess I’ll just be watching everyone else’s progress.